Last month saw a couple of events that reminded us of the spirit of Nationalism of the early 40s. While one was the celebration of our Independence Day, the other was the celebration of the spirit of peaceful protest across the Nation that Anna Hazare led from the Ramlila grounds. One may or may not agree with the methods that Anna Hazare used in keeping the entire Nation charged with this spirit of Nationalism, but one cannot discount the fact that fighting corruption today is as much a household word as corruption itself. We now need to understand what exactly ‘Corruption’ is and how it affects the lives of common people like us. Corruption, defined as the abuse of public power for private gain, has existed for long. It encompasses unilateral abuses by government officials such as embezzlement and nepotism, as well as abuses linking public and private actors such as bribery, extortion, influence peddling and fraud. Evidence confirms that Corruption hurts the poor disproportionately and hinders human development by reducing access to social services and diverting resources away from investments in infrastructure, institutions and social services. It arises in both political and bureaucratic offices and can be petty or grand, organized or unorganized. In the political realm, it undermines democracy and good governance by subverting formal processes. Corruption in elections and in legislative bodies reduces accountability and representation in policy-making, corruption in the judiciary suspends the rule of law, and corruption in public administration results in the unequal provision of services. More generally, it erodes the institutional capacity of government as procedures are disregarded, resources are siphoned off, and officials are hired or promoted without regard to performance. At the same time, it undermines the legitimacy of government and such democratic values as trust and tolerance. In the private sector, it increases the cost of business through the price of illicit payments themselves, the management cost of negotiating with officials, and the risk of breached agreements or detection. Where corruption inflates the cost of business, it also distorts the playing field, shielding firms with connections from competition and thereby sustaining inefficient firms. It also generates economic distortions in the public sector by diverting public investment away from the social sector like education and health care into capital projects where bribes and kickbacks are more plentiful. It also lowers compliance with construction, environmental or other regulations, reduces the quality of government services and infrastructure, and increases budgetary pressures on government. Fighting corruption is no longer a fad and has become a necessity in order to ensure development and a semblance of social and economic justice. We as a Nation have reached a point of frustration in our attempts to fight this menace and are now looking not just for ‘another messiah’ to come and help us fight but also for a strong legislation to provide us with the instruments to fight. Anna Hazare arrived at the right moment with the right intent and could galvanize a society tired of feeling helpless, hopeless and impotent. What we saw was the beginning of the fight for a strong Lokpal bill and many began asking if it would help us in this fight against corruption. It is no secret that this law will only serve as a deterrent and operate when people use it to file cases and pray that the system operates to ensure justice is done. Examples in Hong Kong and other places where the law operates without fear or favour has clearly demonstrated that it can help curb corruption significantly. While the law itself may have a limited role in our fight against corruption, we need to understand the gains that this movement has given us. For the first time in the last many decades, the nation has been galvanized into fighting for a social cause from one platform. Despite muted voices of dissent, we as ordinary citizens have not only found our voice but also the freedom to express it. It was not just the crusade of Anna Hazare, but of lakhs of men and women of all ages and backgrounds who found a platform to express themselves peacefully. What we now need to understand is the awakening of this new India, which lets our citizens engage with a democratic process and participate in matters of State that affect and influence their daily lives. While one may argue and debate on who actually won, I would like to point out that the entire Nation did. On one side, we saw what a charismatic and honest man could achieve when he operated out of the strength of his convictions. We saw the power and potential of a million citizens aroused with the passion of National reconstruction. We also saw the dignity and supremacy of Parliament restored. After many years one actually felt reassured listening to the more than seven hours of parliamentary debate on the bill. The collective consciousness of India was aroused and suddenly we found a National purpose to give our lives for. The level of civic engagement and intent to participate in our fledgling democracy leaves one feeling positive about the future. We now need to ensure that the spirit of reconciliation and partnership that the civil Society, the political class and our parliamentarians displayed is not just a flash in the pan. What one needs is maturity and wisdom on all sides to take this win-win feeling ahead and ensure that this movement sees a logical conclusion acceptable to the whole country. Amidst all this, let us not forget the long and tortuous path ahead. We need to understand that our dream for India should not be a mere anti-corruption legislation, but something more far-reaching than all that. What we see today is not just the degradation and greed of a few but of most Indians in all sectors. And we need to go beyond the demand for a law to ensure that our beliefs, values and practices reflect the true spirit of Gandhi and his message. 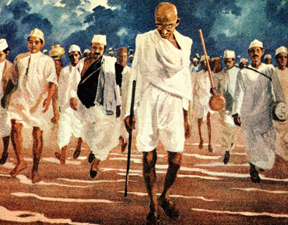 For it is easy for a movement driven by emotion to lose track if not sustained on the platform of spiritual values that Gandhi based his Satyagraha on. Satyagraha is such a demanding responsibility and one needs to go beyond just sloganeering and waving the National flag. It needs to translate into a moral transformation and self-purification of the person indulging in it. A true satyagrahi knows and lives his values deep from within and can neither display any hatred nor any dislike of any person or system. All that he has is a deep and engaging love for truth and keeps expressing his views till he can achieve his intended end by not just peaceful means but also by constant self analysis of his methods and actions. In the Gandhian understanding of peaceful non-violence, there will be no space for self aggrandizement or for the theatrics that we saw displayed last week or bowing down to the vindictiveness that the Government is displaying now. Gandhi was clear in not just the meaning but also the spirit of ‘Satyagraha’ and was always conscious that ‘Satya’ and ‘Aagraha’ went together. Engaging with democracy and legislative processes will attain a higher and nobler stature only after we start engaging with ourselves on a personal and intimate level. We need to be constantly aware of our commitment to love, peace, non-violence and truth on an individual level and strive to live it in all small actions that we perform each day – like waiting for our turn in a queue or stopping at a red light or going out of our way to help a stranger in need. That will be the true Satyagraha that we need to launch immediately and only then will the India of our dreams emerge. Otherwise all that we may get is not a moral society, but a corrupt one with only a law no Gandhian will be truly proud about.